Taking a Family Vacation? No Vacancy for Bedbugs! ACP Worldwide, LLC introduces a 100% effective, all natural and safe bedbug killer that's been successfully tested by an independent laboratory. Test results show 100% mortality in less than 2 minutes for killing bedbugs and their eggs on contact! "Taking a family vacation? 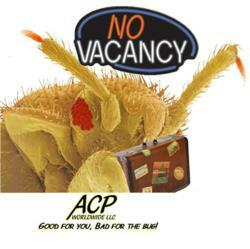 No vacancy for bedbugs!" Summertime is upon us and plans for family vacations abound. One growing concern for vacationers everywhere is picking up an unwanted guest – the bedbug! Great news! Vacationers can easily travel worry-free with ACP Worldwide's new 100% effective, independent laboratory tested, all natural (safe for people, pets and the environment) bedbug killer & repellent that’s simply named Bedbug™. 3. Mortality after direct spray on bedbug eggs. Test results show 100% mortality in less than two (2) minutes for killing bedbugs and their eggs on contact! Test results show Bedbug™ also provides complete repellency for an extended period of time thereafter. These independent laboratory test result reports are posted on the manufacturer’s website. Test results like this have not been achieved by any other bedbug killer formula on the market today. Many other insecticide manufacturers will make bedbug killing claims, but they do not have independent lab results to back up their claims. Bedbug™ does have independent laboratory test results as proof of its bedbug killing and repellency power. Field studies over 16 months also prove the bedbug killing ability of Bedbug™. Bedbug™ is manufactured by ACP Worldwide, LLC, a company that emphasizes the natural and safe power of plant extract oils to kill and repel insects. ACP’s all natural Bedbug™ is formulated completely with ingredients from the EPA’s FIFRA* 25(b) exempt list and has a clean, fresh scent. It is a 100% effective, natural and safe alternative to the poisonous, chemical-based bedbug insecticides on the market today. Please visit ACP’s website for product information While visiting the site, you can also view ACP’s other all natural insect killing & repelling products (i.e. - Skee-do™ mosquito repellent, Ticked-Off™ , etc. ).